It is now November. Oops. 2017 has been filled with travel, writing, editing, and river guiding, and while I have thrown my everything into those endeavors, I’ve greatly slacked with blogging. As I did in June, I’m going to state that this blog is my return to weekly (or at least biweekly) musings. One of the things that filled my time this year was traveling to comic cons across Texas and neighboring states. As authors, we are forced to find new and unique ways to get our names out, or be doomed to fade into the chaotic black hole that is Amazon. 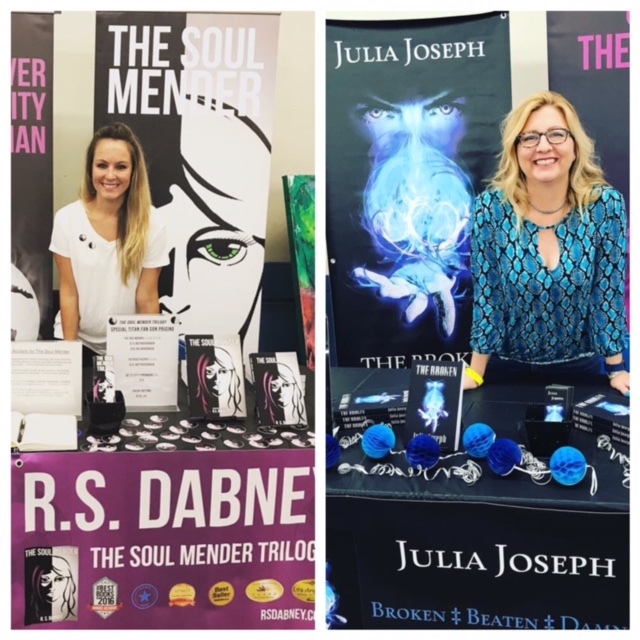 Determined to avoid oblivion, I attended my first comic con in April in El Paso with fellow urban fantasy author, Julia Joseph. We had no idea what to expect. A lot of Star Wars. A few Pokémon. A Joker and a Harley Quinn or two. As self-proclaimed geeks, we were stoked to share our work with this niche group. But in the back of our minds, we wondered if there was a place for genre fiction other than hard sci-fi/fantasy at a convention for comic book nerds, or if we were just wasting our time and money. Since the El Paso Comic Con, we have attended five other cons (Titan Fan in Odessa, Corpus Christi, Hub City in Lubbock, Las Cruces, and Alamo City in San Antonio). Some were widely successful. Others ended up as expensive marketing opportunities. Going in, I wasn’t sure what my expectations were. By the end, I decided that if I could pass out 100 bookmarks and stickers, and sell enough books to break even with the cost of the event, then I would consider a con a success. Even at the “unsuccessful” cons, I was able to make the cost of the table back every time. I wanted to write this blog primarily for other authors. It is a competitive world out there. Everyone is writing books these days. Everyone is on social media, or attending book festivals, or standing up in front of a barely there crowd to try and get the word out about their books. It’s exhausting and slow work, and the only way to step forward is to find unique ways to stand out. When we attended our first comic con, we worried we weren’t exactly what people would be looking for when they showed up. Turns out, that’s a great thing. If you find a place with an unsaturated market to sell books, I guarantee you will do just that. Will you make thousands of dollars in one weekend? I hope so. I did not, but I certainly hope you do. Will you make enough that it’s worth the time and money to let people know who you are and what you’re about? Absolutely. For authors interested in attending future comic cons, here are some things I’ve learned to help you in your journey. 1. Take an author buddy with published books. Booths run anywhere from $125-$350 dollars. If you have a bunch of books out, you can probably cover that cost easily. If you don’t, those numbers can seem daunting when you are used to selling one or two books a month. With a buddy, you cut that cost in half, meaning it’s much easier to at least break even. It is also nice to have someone to talk to, someone to watch your stuff when you need a break, someone to laugh with, and someone who understands your idiosyncrasies. 2. Have something to pass out for free that contains the information someone would need to look you up online. Personally, I hand out bookmarks and stickers. People love free things, and they actually work. At the last con I attended in San Antonio, we had nine additional online sales just from placing a bookmark in someone’s hand. 3. Practice your elevator pitch and spiel. From our first con to our last, Julia and I improved so much in how we interacted with people, and what we said to engage them in our stories. We went blindly to the El Paso show, and still did well with book sales. As we improved, so did our sales. I would encourage you to find the best use of two minutes in which to hook someone into your work. Sometimes you have longer, sometimes shorter. Be prepared to adjust. 4. Take candy! This sounds super elementary, but we lured a lot of people to our booth just by passing out chocolate. Did everyone buy who stopped? Of course not. But they have at least seen our names and heard our titles. Maybe in the future they will remember us, and we will have made an impression. 5. Stand and interact with people, even if that’s not your thing. I get it. I’m an author too. I spend most of my life in pajamas avoiding the outside world. If you pay money for a booth at comic con, or any book festival, you need to commit yourself to overcoming your fears and doing justice to your work. If you are sitting and avoiding eye contact with passersby, I promise they will ignore you back. You don’t have to be obnoxious. Just stand, smile, and say hi to those passing by. This is where #4 comes in. Lure them in with candy then, #3, give them your pitch. Be proud of your work. Stand up and show it. Also, bring a foam mat to stand on. The days are long and the concrete is solid. 6. Have an eye-catching booth. Vendors at comic con know what’s up. Their booths will be colorful and stimulating. Show up with more than just books on your table. Get professionally printed signs to hang from the front and to display behind you. Purchase stands for your books and things to fill blank spaces. If your booth isn’t as professional as the person next to you, then visitors will pass you by. 7. Make friends with the people around you. There are some incredibly talented and kind people who attend these conventions. You will see them over and over as you travel. They are supportive and helpful. I’ve commissioned work from artists I’ve met. I’ve been offered advice on which cons to attend, and what to bring and sell. I’ve teamed up on collaborative projects. We connect on social media and keep in touch. We chuckle at the amusing things we see, and vent about our frustrations with certain shows. After awhile, you sort of feel like you’re part of this big, creative family. 8. Find the other authors in attendance and connect. I’ve met some really neat authors at these conventions, and I still keep in touch with them. I’ve found that authors naturally want to support each other, and that the more support you have in this field, the stronger you will be as a writer. Stop by their booths, buy their books (or do a book swap), connect on social media. Don’t let this opportunity pass you by! 10. Finally, keep your expectations realistic. If you decided to become an author and have a book that’s been published, either traditionally or independently, then you know what a devastatingly slow process this is. Becoming known does not happen over night. Getting your work out there is definitely a marathon. Understanding this, and setting reasonable goals will keep you focused and on track. If you only sell a few books, it’s still a few books more than you would have sold if you stayed home. If you are only able to pass out bookmarks, you still make an impression on someone who might buy your book the next time they run into it. You must keep in mind that sales are not the only point of a con. Marketing yourself and your work is equally significant. Believe in yourself. Take risks. And most importantly, get out there in whatever way you can.